EARRINGS - SARAH COVENTRY. "BLACK EYED SUSAN" FROM 1956. 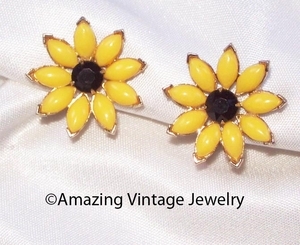 GORGEOUS GOLDTONE FLOWERS WITH YELLOW PETALS AND BLACK RHINESTONE CENTER. CLIP. VERY GOOD CONDITION. NOT MARKED, BUT SHOWN IN THE SARAH COVENTRY BLACK AND WHITE CARDEX FILES. CARDEX FILE NOT INCLUDED.